Select the left opacity stop. This stop is located just above the gradient bar. Use the Opacity slider to specify the amount of transparency for the gradient at its start point. You can also type a value into the Opacity box. Select the right opacity stop and then slide the Opacity slider, or enter a percentage in the text box to specify transparency for the gradient at its end point. The lower the percentage, the less opaque the color. Move the opacity stops to the right or left to adjust the location where Elements applies each stop’s opacity setting. 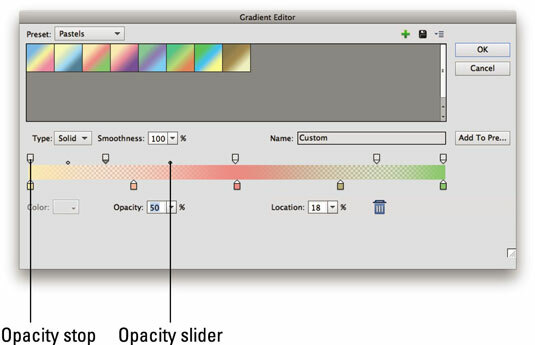 Move the midpoint slider (diamond icon) to adjust how the color and the transparency blend. Click above the gradient bar to add more opacity stops if you want to vary the transparency of the gradient at different points. For example, you can fade transparency from 100 percent to 50 percent and back to 100 percent to produce a particular effect.